I was doing some more experiments with my mapping techniques. I’m becoming happier with them. I do need to improve the sequencing. Work out where I want the map elements (mountains, rivers, forests, etc. ), then finalize river and shoreline before trying to tackle the elements. I screwed up this time a little. 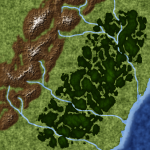 I’d plotted the general course of the rivers, then tweaked their appearance for use in shaping the mountains and forest, then a destructive edit lost me an earlier piece. I was stuck using the rough river forms to actually draw them, and I’m not happy with that. 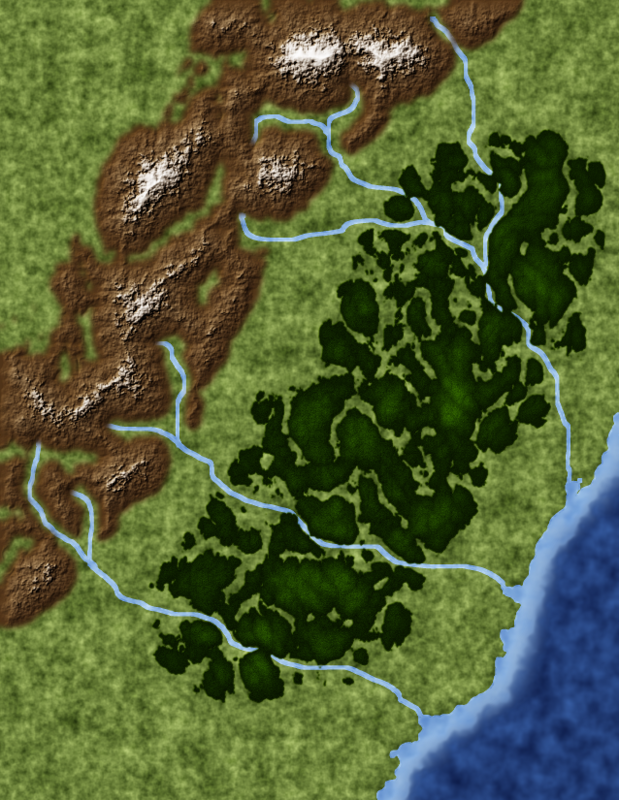 On the plus side, I think I’ve worked out better how to have the rivers come out of the mountains. I got it partly right the way I did it, but the ‘river valleys’ probably shouldn’t be back down the the grass level. I need to use the river courses twice. The first time is while working out the mountain shapes (to a lesser extent, to cover the rivers coming out of the mountains). I think using them a second time when actually working out the mountain heightmaps (which should help ensure I don’t have rivers running uphill — I don’t want the River Police after me). Today’s other lesson: save the 300 DPI work for when preparing something for publication. Letter paper size at 300 DPI eats a lot of memory when you use as many layers as I do. Also, the PNG I originally generated ran 11M, bigger than WordPress will let me load. This image is at 25% of the resolution I was working at. I usually do it the other way around mountains/heightmaps first, then base the river courses on that (fiddling the heightmap a little if a river goes somewhere I don’t want). Anyway, what are you using to make these? They look pretty nice. I’ve gone the modeling route before, with some moderate success, even at the world level. However, I’m at the point now where I usually have a pretty good idea what I want in a map. (Pseudo)randomness helps with the detail, but that’s all I want it for. I’m coming to conclude, though, that most of the time I… don’t need much more than a regional map. It’s nice to know where they’re located in relation to each other, but my campaign map really doesn’t need the sort of detail I’m putting into these ones. To be honest, these aren’t what I’d use in play, either. I just like making pretty maps. As for the tools used, it’s just the GIMP plus the MathMap plugin, and gradually increasing tricks and techniques.